To follow-up on last week’s “Google Buys Arizona and Southern Idaho” post hypothesizing on a shocking title leading to the most popular post ever, um, it was wrong. Ouch, not even close. I knew the A/B testing instructions from mid-January was the post to beat, but I didn’t even crack the top-25. 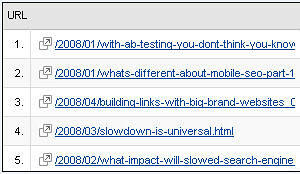 I did have several comments such as “Your title totally made me read the post in my iGoogle today.” Unfortunately, reading our blog in a RSS feed reader doesn’t show up in our Google Analytics KPIs. Consider this hypothesis…BUSTED! If it makes you feel any better, Jeff, once Google does buy Arizona and southern Idaho your older post will probably be ranked much higher than the actual news because of the title tag relevance and the age of the content. Give it time. You could hit number one yet.